About Amjad Ali Khan College of Business Administration :: Muffakham Jah College of Engineering and Technology, Banjara Hills, Hyderabad. The Amjad Ali Khan College of Business Administration (formerly Sultan-ul-Uloom College of Business Administration) was established in the year 1991-92 under the affiliation of Osmania University with the approval of the AICTE, New Delhi and Government of Telangana State. The college has earned state wide recognition for its academic excellence and in meeting the needs of industry for professionally trained graduates. To provide holistic management education by continuously improvising and innovating academic performance through interface with industry. The MBA programme is of two years duration split into four semesters with each semester spread over a period of 14-16 weeks in addition to 6 weeks of project work in any reputed industry or corporate house. 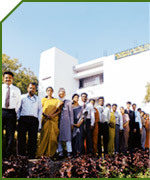 The College strives continuously to uphold high academic standards in post-graduate business education.